The Grow area of the App is where you create the various regions, properties ( Vineyards / Orchards / Plantations …), and sub blocks you will use for your bulk production (Settings) and record work done on your property such as planting, pruning and maintenance (Grower Operations). Provided you are on a subscription level that supports it, this is also where you keep track of when Harvest Deliveries coming are coming in to your facility (Harvest Bookings). An overview of pending and historical grower operations as well as recent harvest entries is found on the Grower Dashboard. In the Grower Dashboard, there is a view titled “Draft Grower Operations (View All).” This panel allows you to view all of the pending and historical grower operations. Operations with the ‘Edit’ button are jobs which are still pending completion. 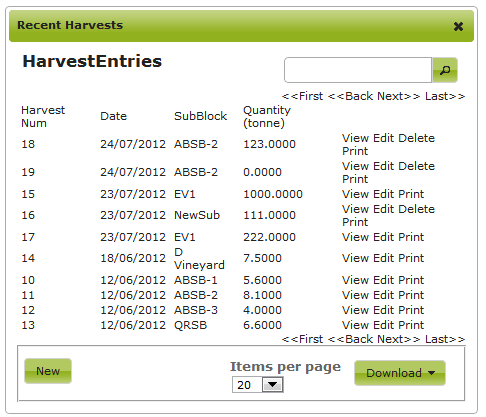 The dashboard also has views for “Recent Harvests” that shows you the recent harvest entries.